Gavin Shaffer is 10-years-old and has been a member of the Oaklawn Boys & Girls Club since May 25, 2011. 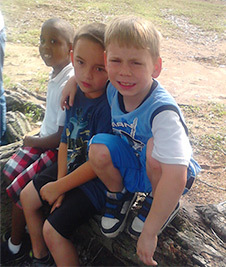 Gavin attends El Paso Elementary where he is picked up daily by the Boys & Girls Club bus. His favorite area of the club is the Computer Room. Gavin loves to print out pictures of his favorite things. Gavin frequently enjoys quiet time alone and can be found often sitting at the art table coloring one of the pictures he has printed. What makes him stand out is his commitment to the Boys & Girls Clubs. He attends daily and is always there to help staff whenever needed. Gavin’s daily task is to shut down the computers at the end of the day and to make sure that the computer room is neat and orderly. He takes this duty very seriously. He is also very helpful in many other areas throughout the Club. Gavin is also involved in many of the Club programs including Power Hour and Triple Play. When Gavin began membership at the Oaklawn Boys & Girls Club, he was transitioning from foster care back to living at home with his mom. Gavin’s mom had struggled with chemical dependency. During this time, Gavin was very withdrawn. For the first few weeks he did not want to attend, and he was reluctant to get out of the car when his mom brought him. Once inside the club, Gavin became very angry and difficult to manage. He acted out and at times became a danger to himself and others. Over time, with the help and support of the Oaklawn staff for both Gavin and his mom, Gavin eventually developed a sense of trust with staff and his behavior improved greatly. Gavin now has fun learning and interacting with his friends at the Oaklawn Boys & Girls Clubs.